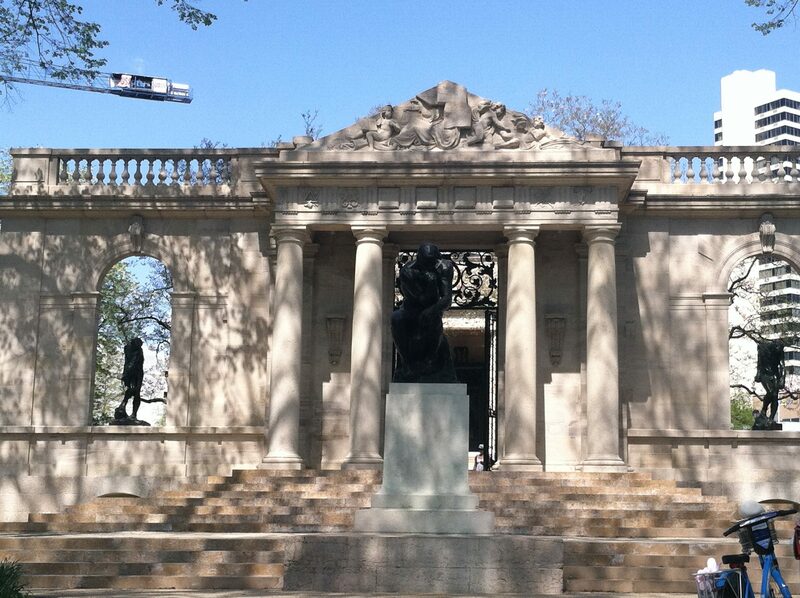 This small museum on the Parkway is one of the two museums in the world exclusively dedicated to the work of sculptor Auguste Rodin (1840-1917), the other being the Musee Rodin in Paris. It is located further northwest than the Barnes Foundation, making it halfway between Logan Square and the Philadelphia Museum of Art. What separates the Rodin Museum from the rest of the Parkway museums is that most of its treasures can be found outdoors. The property is mostly outdoors, with trees around the perimeter, mostly on the Parkway side. The largest and most famous works by Rodin can be found on the outside, including the world-renowned The Thinker. It is in front of the entrance to the museum, where it is easily visible from the street. Being so iconic, it’s the most prominent work of art, as well as something visitors can see without needing to see the rest. Behind it is a facade, which leads to the garden. The statues within it are Adam and The Shade. Beyond this, there is a pool of water with plants and gravel pathways leading to the main building and around the outside. To the right is The Burghers of Calais, a sculpture of French nobles doomed to be executed by the British during the Hundred Year’s War, until they were spared by the British Queen. Near the main entrance is The Gates of Hell, one of the most intimidating works of art around. Inspired by Dante’s Divine Comedy, it depicts Hell, with figures engulfed in the flames. A miniature version of The Thinker is on top, perhaps indicating that he is contemplating Dante’s poem. Inside, the museum has a series of sculptures by Rodin, mostly on a smaller scale than those found outside. it’s actually very small compared to most museums, especially those on the Parkway. These would include The Age of Bronze, Eternal Springtime, and The Apotheosis of Victor Hugo. The few rooms on the inside are filled with his work, including much smaller sculpture. The interior is also a fine work of architecture, done mostly in marble in a Neo-Classical style. It’s actually very small compared to most museums, especially those on the Parkway. The main room also has a skylight, which is a nice touch. Unlike some other art museums, it’s easy to feel overwhelmed with the immense amount of artworks and fellow visitors, but that is not the case here. That’s part of the allure of the Rodin Museum. It’s calming. Whether or not you would feel that way about other art museums, the Rodin Museum is like a nice place to rest and take a breather from all the other things to do and see. Admission is pay what you wish. However, they suggest $10 for adults, $8 for seniors, $7 for students/youth, and children under 12 are free. Admission is free to members of the Philadelphia Museum of Art.